Michael Lewis and EFFORT Racing teammate Ryan Dalziel discuss strategy before practice at Mid-Ohio Sports Car Course on Friday, July 31. Laguna Beach, California — Michael Lewis kept his string of top-5s alive by earning another 5th-place finish in the No. 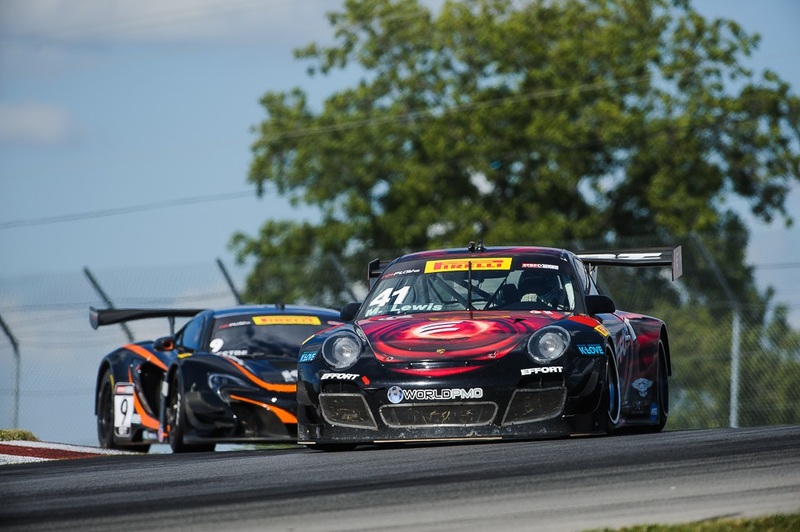 41 EFFORT Racing/Curb-Agajanian Porsche 911 GT3 R in the Pirelli World Challenge (PWC), this time at Mid-Ohio Sports Car Course in Lexington, Ohio. Qualifying for the StopTech Mid-Ohio Grand Prix presented by MOMO took place on the morning of Saturday, August 1. The EFFORT Racing team flawlessly prepared two high-performing Porsche 911 GT3 Rs as Michael qualified his No. 41 with the fourth fastest time of the session at 1:20.319, while his veteran teammate Ryan Dalziel turned a qualifying time of 1:19.838, placing him on the pole position for Saturday afternoon’s race. 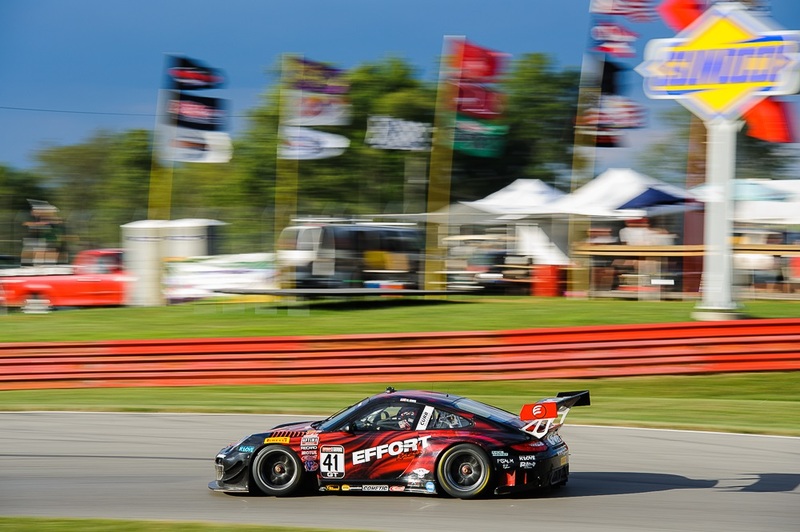 The EFFORT Racing team congratulates Michael Lewis for a stellar performance in qualifying for Round 14 of the Pirelli World Challenge at Mid-Ohio. Seen here from left to right are Reg Schmeiss (tire expert), Stefan Pfeiffer (team engineer), Michael Lewis, Paul Ashworth (car chief No. 41), Chuck Toups (team owner) and Dave Gahagan (car chief on No. 31). 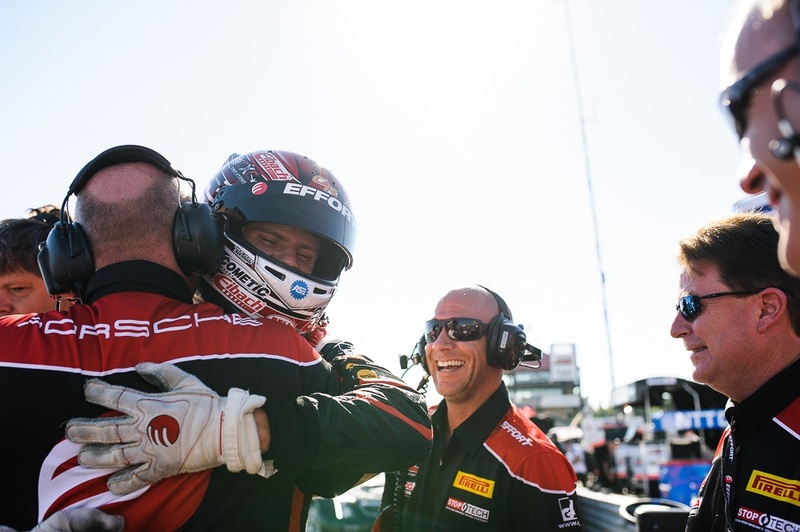 Michael Lewis holds off a challenge by Kevin Estre to earn his third consecutive 5th-place finish in Round 14 of the Pirelli World Challenge, on Saturday, August 1. Round 14 of the PWC was scheduled for late afternoon on Saturday. Michael lined up on the starting grid in 4th position, just outside the second row. When the lights went out to start the race, Michael immediately lost one spot and was in 5th when a full-course caution was issued due to a stalled car on the starting grid. The cars continued on Lap 1 and then crossed the start/finish line for a single-file restart on Lap 2. Michael remained in 5th place, and with 21 minutes left in the 50-minute timed race, another full-course caution came out as the safety crew removed a couple cars stranded off the course. The race restarted with 6 minutes left and Michael was immediately challenged for 5th position. However, he maintained position and concluded the race in 5th of 36 competitors. Michael was also the highest finishing rookie of the race. Michael Lewis is seen here during the Pirelli World Challenge Round 15 when he was part of a pack of cars challenging for position. Planning to carry Saturday’s momentum into Sunday’s race, Michael and the field of 35 other competitors lined up on the starting grid of the 2.285-mile track for the start of Round 15 of the PWC. The starting lights went out at noon, and a repeat of the previous day’s race occurred when Michael fell back one position. Immediately, the yellow flag waved bringing out a full-course caution because a car stalled on the starting grid. The field received the green flag at the start of Lap 2, and Michael quickly joined a train of race cars running nose-to-tail in 5th, 6th, 7th and 8th positions. Just past halfway during the race, a full-course caution occurred to remove a car from the gravel trap. After the restart, Michael was running in a pack of cars all battling for positions when his car got into the car in front of him, which caused that competitor to go off course. Michael finished the race in 6th position, but received a 40-second time penalty for the contact. His finishing position is currently being determined by Pirelli World Challenge officials. The EFFORT Racing team prepared the No. 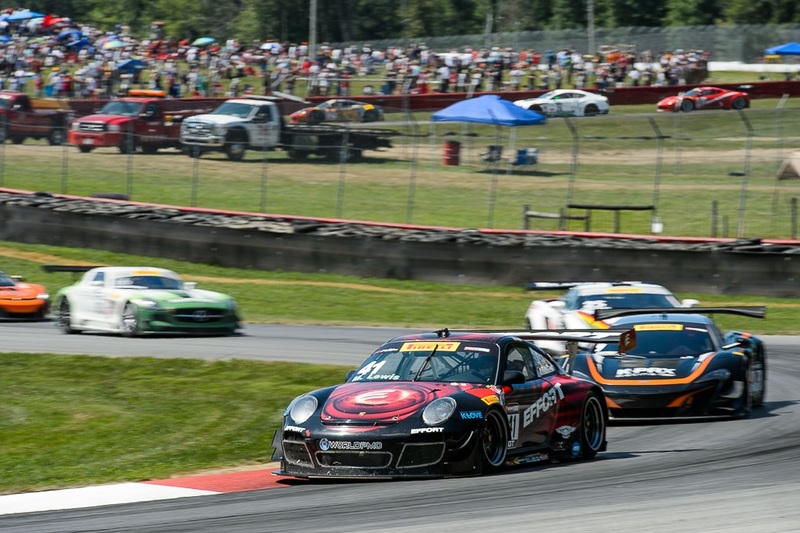 41 EFFORT Racing/Curb-Agajanian Porsche 911 GT3 R flawlessly, which allowed Michael Lewis to run toward the front of the pack at Mid-Ohio Sports Car Course this past weekend. Both Rounds 14 and 15 of the PWC will be broadcast on CBS Sports Network on August 9 at 4 p.m. EDT. Michael will next compete in Rounds 16 and 17 of the Pirelli World Challenge at Miller Motorsports Park in Tooele, Utah, August 21–23. This entry was posted in News on August 5, 2015 . Nice work in Ohio, Michael. On to Utah!